Across our force area works a small team of volunteers, quietly offering support and a listening ear to people during what are often stressful and distressing times. These individuals comfort bereaved families, offer support to railway workers and, as importantly, are a great source of welfare support to our members. Officer and staff wellbeing is firmly on the agenda for all UK police forces and certainly in BTP, chaplains are recognised and valued as an important part of the welfare structure. Andrew Hall is one of twenty-two BTP chaplains. Like his colleagues, he works for the charity Railway Mission and had to pass strict vetting and clearance before joining the force team. Seven years ago - after more than two decades spent working in IT as project manager and systems analyst - Andrew became a chaplain. This somewhat dramatic career change was borne of a desire to help people. Based in the West Midlands, he has become a familiar face at police stations including Wolverhampton, Birmingham, Coventry and the sub-division's headquarters, as well as on the Chiltern Line. We spoke to him to find out more about his role and to dispel some of the myths that persist about chaplaincy (spoiler alert: support is available to everyone, regardless of faith). "We're here as part of a wider range of support. The Railway Mission's strapline is 'support on life's journey'. We see ourselves - and we're recognised in the industry - as being a source of help and part of the welfare structure. It's about there being someone to listen when you've got something to say and that listening is a prime part of what we do. "It's always better to talk about these things. Whatever the circumstances and whoever the person. From my encounters with people I get a sense that they leave feeling lighter and less burdened. I have even sat in a room with someone virtually in silence and they left with a lighter countenance, thanking me for my support." "We are well integrated into the system and we're on the 'checklist' when an incident occurs. In the event of a fatality or a tragic incident on the railways we contact the BTP teams involved and visit the stations. It's important we don't tread on any toes and we are subtle about it. I have also been at the scene of couple of fatalities and have supported officers as they have been in and out of the scene. I was someone they could chat with." 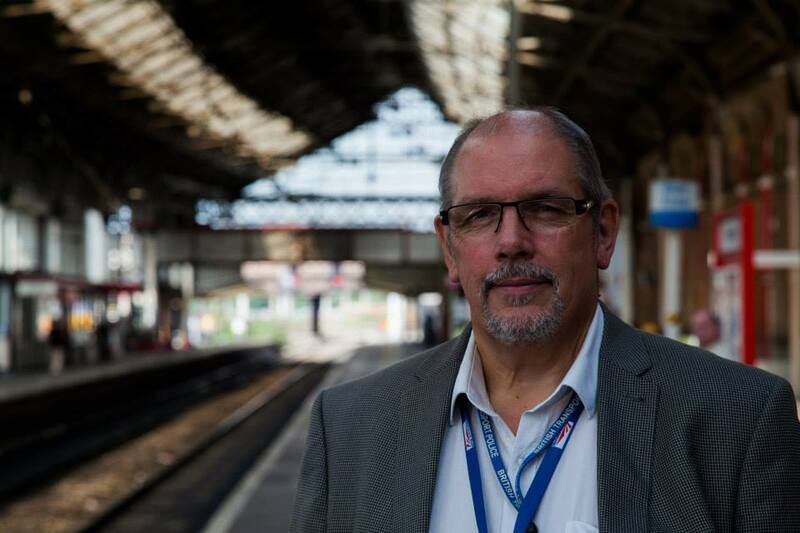 "I remember being on the scene of one particularly tragic incident; the BTP officer in charge had a word with the train manager who announced I was there. Around twenty people spoke to me that night - passengers and staff as well as police officers. ( Change alert:- There have been times when the Coroner's Liaison Officer has called me and asked me to be) I visit departments such as SPMH and Coronor's Liaison and on several occasions have been on stand-by to take a call from a family, and I have I done a couple of funerals on that basis too. Families are totally at a loss as to what to do and, where it has been appropriate, I have been able to direct them." "I meet officers at incidents, or while I'm visiting stations. Sometimes we have a chat there and then or we agree a time to meet. What happens after an initial meeting depends on the person and the circumstance and will be different every time. "I happened to be at a station the day after a fatality and I had gone to speak to rail station staff. There had been a report from a member of the public that they thought they could see some remains on the tracks. The BTP team turned up and the PC leading the team asked me to accompany him and his colleagues. The remains were recovered and I was able to talk it through with them. It's unusual to be in the midst of an incident like that but I felt that I had made a difference to the officers. "We often get involved in situations that will require ongoing contact. Everything is confidential unless matters of safety and security are breached - this is made known upfront so there are some markers. As well as the support we can provide, we have various channels we can signpost to and in terms of faith we can connect someone with support that's local, appropriate and discreet. "Since becoming a chaplain I have noticed more of a culture of talking about traumatic incidents. The Railway Mission has been around since 1881 and so I think we're a trusted source of support, but it takes that culture change for people to feel comfortable sharing their thoughts. In my experience it's often male officers who try to tough their way through and not talk about things. We wouldn't just walk into someone's situation without some sort of bidding but conversations in police stations often get around to fatalities; maybe my presence prompts it! Someone will usually comment on 'a bad one' and you can see that there are ongoing feelings there. That will often prompt a conversation and I can support in some way." "We are available for people of all faiths, and none. I suppose those who haven't dealt with a chaplain may have reservations but where we're known its quite well understood that we're operating from a welfare stance. If faith issues come up we will discuss them; faith motivates us rather than being our main aim." To speak to a Chaplain contact the Executive Director, Liam Johnston on 07718 9871918. Alternatively you can find the contact details for your local Chaplain on the Railway Mission website or BTP Diversity boards.